To march through immortal lands. Ever unplumbed is thy Truth. In Thee the tapestry of Truth. And makes us eternal, free. ” The fourth aspect of the Mother divine is Saraswati or Mahasaraswati. Maheshwari is the Mother of immensity, Mahakali is the Mother of aspiration and Mahalakshmi is the Mother of sweetness, beauty, fragrance and harmony. But Mahasaraswati is the Mother of perfection, knowledge and wisdom. When we walk along the mental paths when we start our journey in the mental world, the first thing we do is invoke this Mother, Mahasaraswati. With her blessing we commence our mental journey and in all our mental and intellectual life we carry her sweetest, highest blessing. Perfect perfection she demands from her devotees. This Mother is a cosmic musician, a supernal musician. 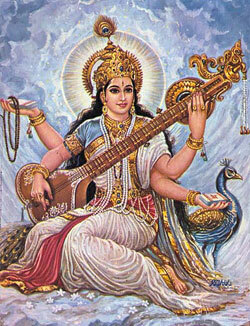 She plays on the vina and, while playing, she offers transcendental Delight to Brahma. Brahma is the Creator and Saraswati is his consort. Each god and goddess has a secret, special name. This secret name we call the seed-sound. Each cosmic god and goddess has adopted one special sound in order to fulfil God’s cosmic Play. God’s soundless sound we know is anahata. The outer life is an open book; but the inner life is a secret life, a life of sweetness and divine enjoyment. We know that Lord Krishna has hundreds of names in the outer world: Krishna, Gopal and others. But in the inner world, for his devotees, he has a spiritual name or seed-sound. That seed-sound is Kling. If we can say Kling most powerfully and soulfully, from this seed-sound Krishna’s divine Joy, divine Love and divine Beauty can be seen and felt inside our heart. The seed-sound of Kali is Kring. You can repeat “Kali, Kali, Kali,” but sincere seekers who want to make the fastest progress should repeat Kring very powerfully. Kali you can say softly, but if you say Kring softly, it will have no effect. You have to say Kring with tremendous power so that you feel that your whole being is vibrating with the sound that you are producing from your heart. At that time, Mother Kali will immediately stand in front of you with her boundless power, boundless compassion and fastest speed to help you reach the Goal. Of course, please try to bring to the fore your divine dynamic aspect as you chant. While you are using this mantra please do not have undivine qualities inside you. If the utterance is perfect, immediately the result will be most powerful, most soulful. Then, if you want to invoke the seed-sound of Maheshwari you can say Hring most soulfully. The seed-sound of Lakshmi is Sring. If you want divine beauty, cosmic beauty, inner beauty and harmony, then you have to invoke Mahalakshmi. If you want perfection, patience, inner wisdom and inner light for everything you do, for that you need to invoke Saraswati. Her seed-sound is Ohing. These four goddesses represent the four major aspects of the Mother Divine, her four transcendental forms. These four aspects are for all divine seekers, and if a seeker wants to, he can invoke all four aspects at the same time. But individual seekers usually approach just one particular aspect of the Divine Mother. You can say that each individual has his own way of approaching the Goal or a certain connection with one of these aspects of God. If we worship the particular aspect that is meant for us, then we will be very successful in our life. But if we need perfection and we pray to the wrong goddess, then it will only take more time for us to achieve what we need. It is true that we can reach God through our aspiration and get perfection, power, knowledge and everything. But our capacity is very limited, and often we cannot or do not dare to get everything. If we feel that something will suit our nature and satisfy our soul or feed our inner hunger for the time being, then we should pray to a particular aspect of God.